This article was originally published at LobeLog. US Secretary of State John Kerry landed in Israel on Jan. 2, starting 2014 with an attempt to save what is increasingly looking like a doomed round of negotiations between Israel and the Palestinian Authority. The rest of Netanyahu’s speech was entirely devoted to depicting the imminent failure of peace talks on the PA. One important note he made was that PA President Mahmoud Abbas has not condemned the recent attacks on Israelis, including a bus bomb on Dec. 22, which caused no casualties, but which has raised the alarm level in Israel. It is worth noting that an attack like this one has usually been condemned by the PA, and Netanyahu has seized on the absence of such condemnation to “prove” ill will on the Palestinians’ part. While that argument may be self-serving, it is still noteworthy. Abbas is dealing with a Palestinian public that has no faith in the current American efforts. What little there ever was has been completely undermined by word that the US agrees that Israel will be allowed to maintain forces in the West Bank even after the so-called “end of the occupation,” and that this is reflected in the proposals Kerry has brought along with him. Particularly because no Israelis were seriously hurt in the bus bombing last month, Abbas’ silence could well reflect his sense that his position in Ramallah is very tenuous, amid growing calls to abandon the current course of action and move toward efforts in the United Nations. For his part, Kerry strove to keep a thread of optimism alive, saying that Israeli-Palestinian peace was “not mission impossible.” But he closed by pointing to “tough choices in the coming weeks,” likely a message that the United States is reaching the limit of what it can do (or, more likely, what it is capable of doing, given domestic political constraints) and that success or failure of the process is now in the hands of Israelis and Palestinians. 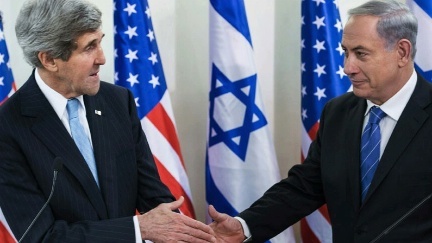 Today, Kerry will be heading to Ramallah to meet with Abbas. The Secretary of State’s message is likely to be similar to the one he delivered in Israel. The smart money is on Abbas playing his own version of the blame game, but he has some options. Netanyahu cleverly postponed announcing yet another wave of new settlements until after Kerry leaves, but the plan is well known enough that Abbas can denounce it today if he so chooses. Or, he can try to take the high road and avoid the blame game, expressing a more hopeful sentiment. Whichever course Abbas chooses, the apparent fact that the US has decided that an ongoing Israeli military presence in the Jordan Valley (and possibly some other concessions to Israel regarding the pursuit and arrest of alleged terrorists) is not something he can concede. The trap for Abbas is clearly set, and he may not be able to escape it. The only question is whether or not Kerry and President Obama have learned enough from the disastrous results of Bill Clinton’s decision to break his promise and blame the failure of Camp David II 13 years ago solely on Yasir Arafat not to repeat that mistake today with Abbas. The track record of US leaders learning from history, however, is not promising.